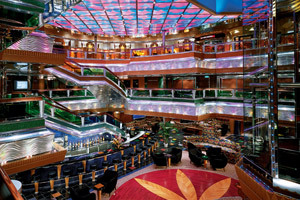 The 110,000-ton Carnival Glory is a beautiful Conquest Class ship. This massive and recently refurbished cruise ship can be found cruising in a number of destinations, such as the Bahamas and Caribbean, as well as Canada & New England. While on a Carnival Glory cruise you're sure to find plenty of great things to do throughout the ship's 13 passenger decks. 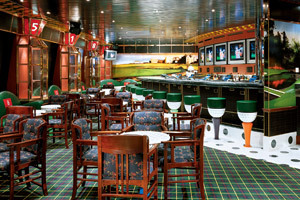 As of 2012, Carnival Glory has added a whole assortment of activity options onboard. 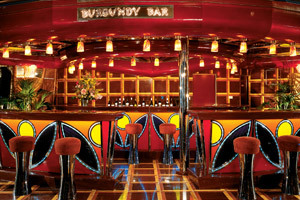 New bars include the RedFrog Rum Bar and the BlueIguana Tequila Bar each serving delicious cocktails with their representative liquors. Food venues have been expanded with the addition of the taco joint BlueIguana Cantina and delicious burger bar Guy's Burger Joint. Food and drinks are not the only additions. Guests can now enjoy a comedy show at The Punchliner Comedy Club, sporting events at EA Sports Bar, stage shows at Playlist Productions, and even a feature length fil at Dine-In Movies. Among Carnival Glory's many entertainment options and activities are a large show lounge, Carnival's Seaside Theatre (featuring a 270-square-foot screen and 70,000-watt sound system), casino, waterslide, 9-hole mini-golf course, ping pong, volleyball, shuffleboard, basketball, swimming pools, hot tubs, internet cafe, photo gallery, library, many bars and lounges (including White Heat Dance Club, Ebony Cabaret Aft Lounge, and Burgundy Wine Bar), full-service spa and fitness center. Being a very family-friendly cruise ship, Carnival Glory has a wonderful youth program on board. 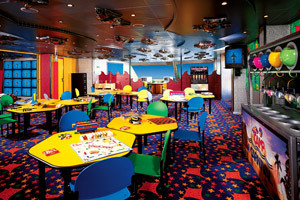 Camp Carnival is an area of the ship that offers guests supervised activities for their children (ages 2 through 11). Circle "C" is for 12- to 14-year olds, and features a high-tech sound and lighting system, plasma-screen TVs and video games. Club O2 is a definite hot spot for teens, as it's an area of the ship that features video games, parties, dancing and much more! You should never have a hard time finding a meal while on a Carnival Glory cruise. 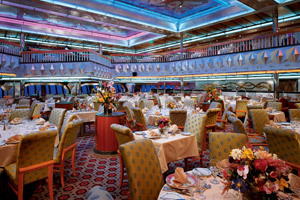 Included in the ship's numerous dining options are the main dining rooms (where you can choose between Assigned or Your Time, an open format, Dining for dinner), The Emerald Room Steakhouse (an optional specialty restaurant that has a per person cover charge), a coffee bar, as well as the super convenient 24-hour room service. Guests that are on a Carnival Glory cruise should have the opportunity to enjoy this three-deck high waterslide that has exciting twists and turns. It's sure to provide a fun time for everyone! 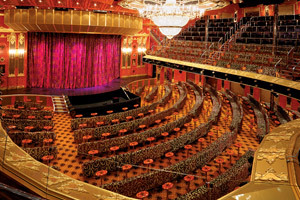 Carnival Glory's main show lounge, Amber Palace, is a large (three-level) theater where you can enjoy a live show during each night of your cruise. Among the possible performances are Broadway-style production shows, comedians, game shows, musicians, acrobats and magicians. There is a wonderful variety of games available at this large casino. 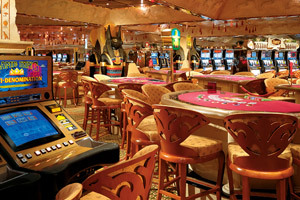 For instance, you can test your luck by playing blackjack, craps, poker, roulette or any of the many slot machines. 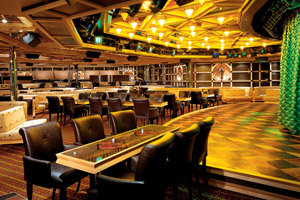 There are usually even gaming tournaments available during a Carnival Glory cruise, featuring games such as Texas Hold'em. If you're looking to truly get some rest and relaxation, consider enjoying one of the many treatments available at Carnival Glory's full service spa. Possible spa treatments include body wraps, acupuncture, facials and massages. 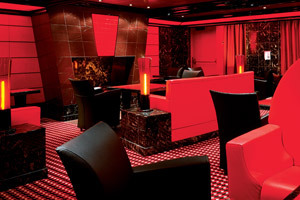 Also in this area of the ship is a beauty salon and fitness center, featuring a nice selection of state-of-the-art fitness equipment. 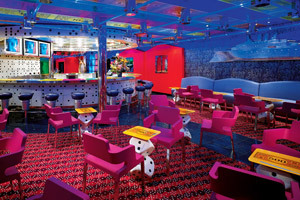 This is a two-level adults-only retreat on board Carnival Glory, where guests can relax during their cruise. Within this area of the ship are shaded sun loungers, hammocks, a full bar and two oversized whirlpools. 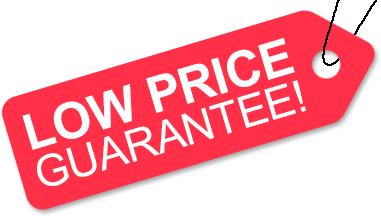 Low Price Guarantee on all Carnival Glory Cruises! Book any Carnival Glory cruise with us and you'll get the best deal possible, regardless of the ship or sail date! Because of our "Low Price Guarantee," nobody beats our Carnival Glory cruise prices, so look around and you're sure to find the best Carnival Glory cruise deal possible when booking with us! Pre-Paid Gratuities on Carnival Glory Cruises! Get Cruise Cash when you book a Carnival Glory cruise with us. The value of the Cruise Cash depends on the particular cruise and accommodations you book. Cruise Cash values are listed on Step 3 of the online booking process. Save up to 20% on Carnival Glory Cruises! Book a 3- to 5-night Carnival Glory cruise at least 3-months in advance, or a 6-night or longer Carnival Glory cruise at least 5 months in advance and save up to 20%! Plus, get Price Protection from Carnival: If you find a lower Carnival Advertised Rate, after booking, Carnival will honor it and issue the difference in the form of a non-refundable onboard credit. We do not charge booking fees on any cruises! You're sure to enjoy an affordable Carnival Glory cruise when booking with us! Our special offers on Carnival Glory cruises may not be combinable. Certain restrictions apply to each offer. View terms and conditions during the online booking process. Click a price below to view the Carnival Glory cruises during that month in that destination.